Thanks to Jerry Gunderson for this 1.5 minute Kleenex experience! This entry was posted in Fun Stuff on April 29, 2013 by Loretta Stanton. There is an organization here on Bainbridge Island called Arms Around Bainbridge. Arms Around Bainbridge began in 2007 with seven friends, a thirty mile swim around Bainbridge Island, and one vision: to provide financial and emotional support to Olivia Carey as she battled ovarian cancer (Olivia was my friend and colleague.) It immediately became apparent that Olivia’s challenges were not unique. Since 2007, AAB has helped and supported other residents in financial crisis due to life-threatening illness. Recently, cyclists, runners & rowers have joined to assist AAB in raising funds for current & future recipients. On May 19, there will be a Spin-A-Thon fundraiser at Island Fitness. A group of friends/students/clients has put together a Team Loretta. Please consider giving to this worthwhile organization. While I am not a AAB recipient, your donation will help serve more people who need help during the most difficult time of their lives. This entry was posted in Thoughts on April 27, 2013 by Loretta Stanton. The infusion for round three is underway. She has finished the easy stuff – the anti-nausea drugs – and the pump starts beeping to let people know that it is time to do something else. The “something else” in this case is the “Red Devil” – Doxorubicin (Adriamycin) – which is the stuff that is so caustic that the nurse has to use a special gown, gloves and mask to protect herself. They also have to have another person verify that what they are about to inject straight into her heart is the right stuff. They don’t like to make mistakes. Probably because it is so expensive. Dinner (for Loretta) was tomato soup, some crackers and Lorna Doones. For some reason, Lorna Doones seem to be the cookie of choice in places like this. I’m not sure if it is because they get them cheap or if there is some curative property of the lowly Lorna Doone. This entry was posted in Treatment Updates on April 22, 2013 by Scott Stanton. 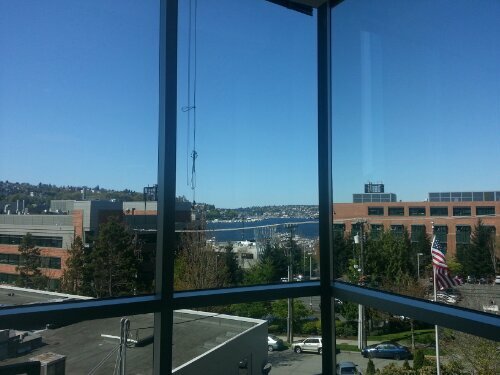 Another perfect day in the Pacific Northwet as seen from the waiting room at SCCA. Another day of chemo. This will be number three of the four AC rounds. They are working up her blood first to see if she’s ready. We are waiting to see the oncologist next. 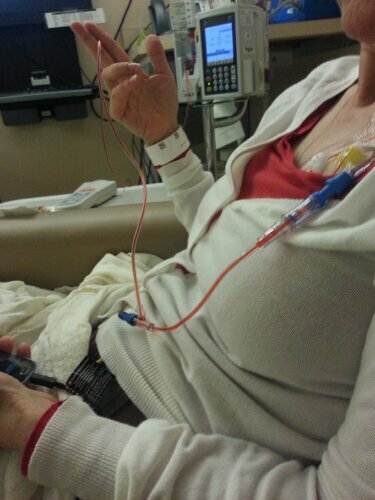 Then the infusion. I was going to write a post on Monday but when the events in Boston occurred it didn’t feel right or appropriate to go on about my mundane week. My thoughts and prayers go out to all those injured and their families and to those who witnessed such horror. As earlier stated, my week was fairly mundane. I did not feel great on Friday – Sunday but not horrible either. I think the combination of Nuelasta and a lower chemo dose worked. I have not had to visit Paradise. I feel stronger each day this week and will be ready for the next onslaught on May 22. My sister Christine left this morning. She stayed for three weeks. She was originally scheduled to stay for two weeks but since my chemo was delayed a week, she stayed longer. It was great having her here. It means so much to me that all my siblings will come and visit. I am very lucky to have such great family. My friends (and family) have brought meals, sent cards and flowers, bought me great gifts, prayed, knitted hats, texted, emailed, walked my dog, visited, called and performed many other acts of kindness not mentioned but greatly appreciated. You all are the helpers in my life. I will end this post with a quote from Mr Rogers. Even if you have read it, it is always good to read it again. I am very grateful to all those in my life who are helping and caring for me. We should remember how many helpers there are in the world. This entry was posted in Thoughts on April 17, 2013 by Loretta Stanton. When it was decided that I would give myself the white cell booster 24 hours after chemo (I had the first dose immediately after the first cycle of chemo) to see if it would work better, I thought it was going to be an auto inject. The preloaded type that you push a button and a small spring injects the needle and medicine. But, no…this was a regular syringe preloaded with the medicine. No auto inject here. My oncology nurse gave me an injection lesson. You practice on a pretend piece of flesh. She showed me how to do it with a practice syringe. Then I practiced. Lo and behold I bent the needle! I was reassured that this would not happen when I gave myself the real injection. I don’t know if the Neulasta is boosting my white cells. I hope it is. I try to imagine my bone marrow going to town producing those lymphocytes. I do know that I won’t have any issues injecting the next two rounds of Neulasta. After all the worry, it turned out to be a non event. This entry was posted in Treatment Updates on April 12, 2013 by Loretta Stanton. 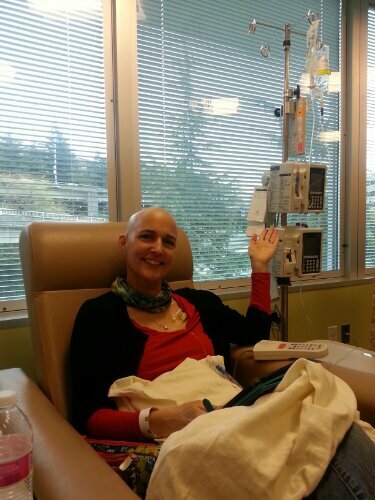 Monday chemo on Tuesday, cause that’s how I roll! Actually, I couldn’t have chemo on Monday this week because there was no room at the Inn. I will go back to Monday’s in two weeks. All the low blood counts are way up so that is a positive. My sister Christine came with me and we walked from the ferry to SCCA (about 2.3 miles) another positive. My friend Jeanne picked us up and drove us home, yet another positive. I am home. My friend Sandi brought over dinner, David and Rachel came by to say hello. Positive, positive, positive. Right now I am laying on the couch, cause that’s how I roll. This entry was posted in Treatment Updates on April 9, 2013 by Loretta Stanton. I get a lot of feedback about how much people appreciate the blog. They look forward to the next post. The blog makes them feel connected to me. Well, I want to thank everyone for taking the time to read all the posts. To those that feel comfortable commenting, your thoughts are appreciated more than I can say. To those that don’t comment, I know you are out there sending me good karma, prayers, etc. I want you to know how much all your thoughts and words mean to me. There are days that I don’t post because I feel like I would bore you to tears with the details of my ordinary life. I have tried to keep my thoughts positive because that is really how I feel most of the time. Just to let you know, I do have moments of deep emotional anguish. Writing the blog helps me get through some of these moments. I am more comfortable writing them out then talking about them over and over and over…. I am a “feel it and deal with it” kind of person. I know there are a lot of cancer support groups out there. Right now I don’t feel like I need them. I am so fortunate to have a husband to pull me off the ceiling when I get myself in a tizzy; to have amazing siblings who have started taking turns to come and help me; to have the best friends that feed my body and soul and send me the most amazing gifts. So, thank you for indulging me and being my support group. This entry was posted in Thoughts on April 7, 2013 by Loretta Stanton. Late last night Loretta decided that it was time to go sans cheveux*. So, using a shaver for the first time, we buzzed through it. She tried a couple of passes and I finished it off. I hope this is the last big emotional hurdle in this set of chemo. This morning we made it a lot better with my electric shaver. Now she has a relatively smooth scalp. I’m conflicted because she looks really great without hair and really great with hair. She could easily pull this off as a style choice. I think maybe 1/4″ of hair (when it comes back) would be a really great look. (And cheap to maintain – a real bonus.) I guess it was to be expected – she’s a beautiful person. Here’s a little video of how it went. It only took a little longer to do than this video takes to watch. *This is French for “without cheveux” which might be “no rabbit” for all I know. My French is limited to fries and dressing. 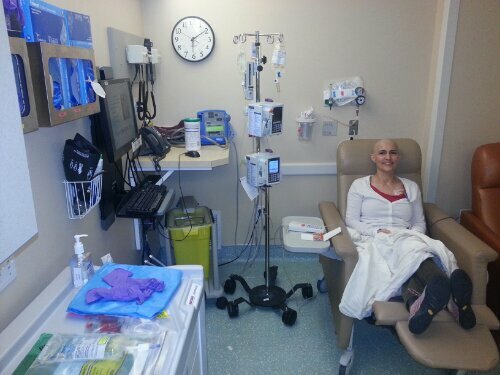 This entry was posted in Fun Stuff, Treatment Updates on April 6, 2013 by Scott Stanton. I know I just wrote a post about hair but it is kinda on my mind (not for long.) About two days ago I was fixing the side burn part of my hair and it came out in my hand. Well I thought, I won’t need to trim that for a while. I called for my sister, Christine, who is staying for a few weeks. I showed her the chunk of hair. There wasn’t much to say. It is very weird to pull wads of hair out of your head. It is amazing how much hair we really have. Today was a windy day. I was wearing a hat. On the walk back from PT (this is the PT who works on my lymphatic system and surgery site as opposed to the PT that works on my pinched nerve. I am a project.) I decided to pull a little chunk of hair out near the nape of my neck and let it go with the breeze. I showed Christine where I pulled out the hair. She said “Oh you might not want to do that as there is a “v” shaped space in the back of your hair.” I said “Well I can fix that.” So I pulled another chunk out on the other side to even things out. I felt like standing there with my hat off and pulling all my hair out so it could go with the wind. But then I probably would have ended up in the police blotter. (For my non Bainbridge Island readers, the Bainbridge Review police blotter has some off the wall items that only happen in small towns.) I can see the headline now “Island Trainer Loses Hair in Massive Wind Storm. Fined For Littering.” I kept my hat on and walked home. This entry was posted in Thoughts on April 5, 2013 by Loretta Stanton.